We feature world-class athletes who perform extreme trampoline shows for the NBA, NFL, NCAA, NHL, WNBA, campuses, fairs, festivals, parades as well as for corporate messaging, marketing, and motivational events. Flippenout's Extreme Trampoline Shows are unique and explosive entertainment that appeal to audiences of all ages. 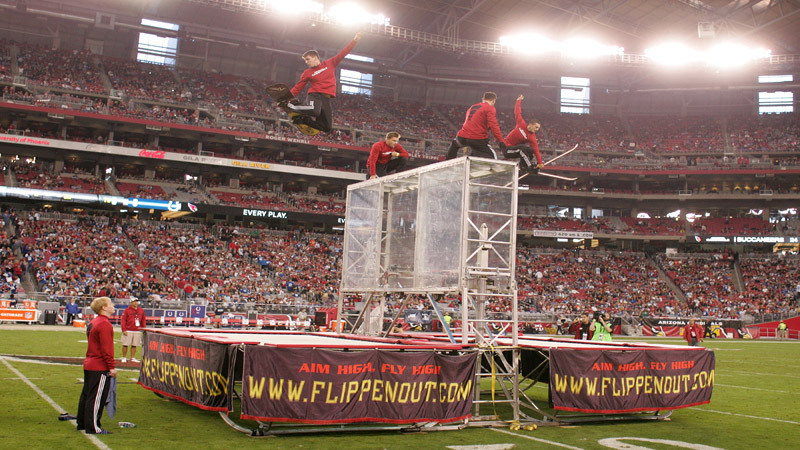 FLIPPENOUT ATHLETES BREAK GUINESS WORLD RECORD FOR HIGHEST TRAMPOLINE BOUNCE (TEAM) ON JULY 13, 2012! Our transparent wall shows add an exciting cirque-style dimension to our double trampoline shows - these transparent wall shows are unlike any other acrobatic show seen elsewhere! The website was created by: websitedesigner.com.